Along with barrel bombings in towns and cities across Syria, this last week saw a series of attacks by Assad’s air force on civilian targets in the northern town of Raqqa. These regime air attacks were sandwiched between two weekends of airstrikes by the US-led coalition on ISIS targets in Raqqa. When US and allied air forces first began strikes in Syria, there was speculation that their presence would deter attacks by Assad’s air force against civilians, at least in the US area of operations. This past week’s events demonstrates that any such deterrent effect is fading if not over. The taking of turns in Raqqa’s airspace by Assad’s air force and US-led forces further undermines US claims of concern for the fate of Syrian civilians. On Sunday 23 November, US warplanes carried out two strikes against an ISIS-occupied building in the city of Raqqa in north-eastern Syria. No civilian casualties were reported. On Tuesday 25 November, Assad’s air force carried out ten air attacks on Raqqa, reportedly killing as many as 209 people, most if not all civilians. Targets were reported to include a busy marketplace, a bus depot, and a mosque where dozens of people were gathered for prayers. On Thursday 27 November, Assad’s air force carried out between seven and ten further attacks, including one at the city’s National Hospital, reportedly killing at least seven more people. On Friday 28 November, Assad’s air force carried out three attacks in Raqqa, killing at least five people including three children. On Saturday 29 November, Assad’s air force again attacked Raqqa’s National Hospital. LCC Syria named five people killed. In the evening of Saturday 29 November, US-led coalition aircraft were reported to have carried out at least 15 airstrikes. Later reports said the total had exceeded 30 airstrikes. The activist group Raqqa Is Being Slaughtered Silently reported that all the targets of the US-led coalition were ISIS bases, hitting a high number of ISIS fighters. The following are press reports of casualties from Tuesday’s attacks in Raqqa. Numbers given for people killed rose over time. No press reports gave precise numbers for people maimed and injured. Activists: Syrian strikes kill 60 in IS-held city, Associated Press, 25 November. Cites initial counts of number killed – SOHR: over 60, LCC: at least 70, Raqqa Is Being Slaughtered Silently: over 80 killed. Syria conflict: Raqqa air strikes death toll rises, BBC News, updated 26 November. Cites LCC as documenting 87 deaths and warning of more injured likely to die due to lack of medical facilities. Cites SOHR saying at least 95 killed, of whom at least 52 have been confirmed as civilians. ‘Scores dead’ in air strikes on Syria’s Raqaa, Al Jazeera, updated 26 November. Updated to cite activists as saying 135 people were killed. By Friday 28 November, the activist group Raqqa Is Being Slaughtered Silently said they had documented 209 people killed in Tuesday’s air attacks. The above tweet from the US Department of State’s Bureau of Conflict and Stabilization Operations was widely retweeted, reproduced, and criticised for characterising the Assad air force attacks as a misfired attempt to target ISIS when there was no evidence given in the linked story or elsewhere that the intended target was ISIS rather than the civilian victims. US ‘horrified’ by Syrian raids on Raqqa, AFP, 27 November. Unsurprisingly, words without action did little to stem criticism. 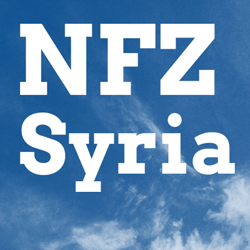 Syrian National Coalition Demands Use of Force Against Syrian Regime Aircraft Targeting Civilians from US Area of Operations, Syrian Coalition statement, 26 November. Syrian Coalition Decries the US-led Alliance’s Silence over Al Raqqa Massacre, Syrian Coalition statement, 27 November. Conflicting Policies on Syria and Islamic State Erode U.S. Standing in Mideast, Anne Barnard, The New York Times, 27 November. Syria, U.S. attack same Syrian city, then trade barbs, Hugh Naylor, The Washington Post, 28 November. The exchange of roles between the Alliance and Assad freak out US State Department, Hamoud Al-Mousa, Raqqa is Being Slaughtered Silently, 28 November. This post from Friday put the number killed in Tuesday’s attacks at 209. It said that with further regime air attacks on Thursday the week’s total had reached 232 people killed and hundreds injured. The above assertion by un-named Obama administration officials reported October 7th was refuted the following day by New York Times journalist Anne Barnard in an article titled US Focus on ISIS Frees Syria to Battle Rebels, where she gave a taste of the ongoing air attacks being carried out by Assad’s air force from the same air space being flown by US and allied air forces. There is some evidence that Assad scaled back air attacks following the start of US strikes within Syria. According to the Violations Documentation Center in Syria, recorded numbers of people confirmed killed by air attacks in the first twelve days from 23 September showed a dramatic drop compared to the period before US strikes began. In the weeks following the recorded numbers of daily deaths rose again, but the number confirmed killed in October was still lower than in September. Numbers of people recorded killed by ground forces (shelling and shooting) also fell in this period, suggesting that the drop in killing by Assad’s air force wasn’t purely because of it operating in a restricted space to avoid US and allied air forces, but may have been part of a wider strategic decision by the Assad regime to reduce the level of violence following the start of the US-led intervention. It’s hard to draw clear conclusions on regime intentions from numbers of violent deaths alone. Since the peak number for violent deaths recorded in August 2012, vast numbers of Syrians have fled the country, consequently reducing the number at risk of being killed in any attack. Also, since that 2012 peak in killing, Syrian ground forces and militia have been reinforced by Iranian and Hezbollah forces, who may be more professional and militarily focused in their approach. 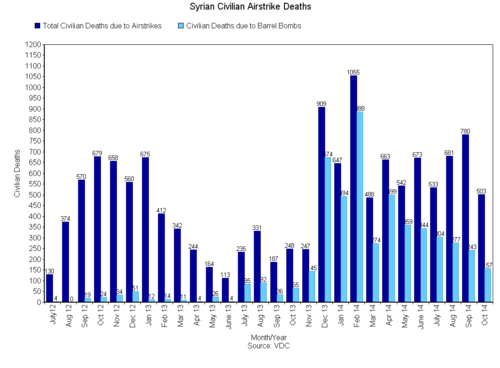 However, looking just at deaths from air attacks, one can see that a rise up to August 2013 seems to have been interrupted by the threat of an international response to the Ghouta chemical weapons attack, only to be resumed with increased ferocity once that threat had clearly passed in December 2013. Killings by air attacks peaked in February 2014, but dropped following the passing of UN Security Council Resolution 2139 which explicitly demanded an end to barrel bombing and threatened further action in the event of non-compliance. As that threat of UN Security Council action faded, the rate of killing by air was again rising in September 2014 before the US-led Coalition action against ISIS in Syria began. It was reasonable then to expect the post-intervention lull in killing to be short-lived—for it to be followed by a tentative escalation to test the risk of a US response, then greater escalation as no US substantial response came—and short-lived it now seems to have been. Targeting civilians is the rule rather than the exception for Assad’s air force. Most attacks are too inaccurate for the regime to risk striking front-line rebel fighters as they could just as easily hit Assad’s own forces, so instead air attacks are used to terrorise, destabilise, and depopulate areas outside of regime control. Historically Assad’s air force has focused these attacks on areas under rebel control, not areas under ISIS control, as the regime apparently sees ISIS as less of a threat to its rule, and according to many reports actively colludes with ISIS to weaken rebel forces. As ISIS in Raqqa has come under US attack, it may be that the Assad regime sees a danger of Raqqa again becoming independent of both ISIS and the regime, and has therefore decided to target the city with increased ferocity. For an analysis of the Assad regime’s air bombardment strategy see Barrel Bombs: A tool to force displacement in Eastern Aleppo, by Ryan O’Farrell, Tahrir Souri, via EA WorldView. Dennis Ross, a former special assistant to President Obama, points to two reasons the Obama Administration does not want to strike Assad’s air force, both related to Iran. One reason is the fear, voiced to him by “a senior administration official” that any direct attack on Assad by the US would be met with retaliation by Iran’s militia proxies against US forces in Iraq. The other reason is Obama’s desire to reach a nuclear agreement with Iran. According to leaked accounts, a recent letter from President Obama to Iran’s Supreme Leader Ayatollah Ali Khamenei on the nuclear negotiations included an assurance that the US didn’t intend to strike Assad’s forces in Syria. When those negotiations, supposed to conclude on Monday 24 November, were instead extended to a completion deadline of 1 June 2015, Assad would have had good reason to believe that Obama’s assurance not to use direct military force against him was now similarly extended. Such a belief would no doubt have been reinforced by the dismissal of Chuck Hagel, US Defense Secretary, which also came on Monday 24 November. This was generally believed to be linked to Hagel’s criticism of Obama’s hands-off policy towards Assad. With the reassurance of these two events, it seems Assad felt safe to proceed the next day with his wave of attacks against Raqqa’s population. The term appeasement is often overused. To negotiate with an enemy, to try and reach a peaceful settlement, is not in itself appeasement. But to trade the life and liberty of another country’s citizens in the pursuit of a hoped-for settlement that doesn’t serve their interests, that is a trade-off that deserves the name appeasement. Obama’s free pass to Assad’s air force in exchange for a hoped-for nuclear deal with Iran is appeasement, and no form of public relations statement from the State Department’s spokesperson can alter that harsh fact. For the past two months international attention has been focused on the heroic battle going on in Kobane in northern Syria, where the forces of the Kurdish People’s Protection Brigades (YPG) and the Free Syrian Army have successfully withstood an onslaught by the brutal ISIS organisation. But Syria is a country with many Kobanes, as blogger Leilashrooms has pointed out. Across its length and breadth cities, towns and villages are fighting for their lives – against ISIS, against the equally brutal regime of Bashar al-Assad, and in some cases against both at the same time. The Syria Solidarity Movement UK has launched a campaign under the banner of “Syria’s Forgotten Cities” to inform people of the realities of these ongoing struggles and to encourage support for their cause. This site is part of that campaign. Here we will tell you the stories of three Syrian cities involved in these struggles – ALEPPO, HOMS, and RAQQA (the city which ISIS has declared its “capital” but where resistance to its repressive rule goes on). Just follow the links at the top of this page. But there is a much longer roll of honour – Daraa, Daraya, Deir Ez-Zour, Douma, Hama, Jobar, Idlib, Yarmouk, Zamalka (to name a few) – places battered but not beaten, and where the fight for freedom and dignity goes on. Let us remember all those “forgotten cities” in the coming weeks and do whatever we can to support their struggles. You can also follow Syria’s Forgotten Cities on Facebook and on Twitter.